Do you have very localized pain about the size of a golf ball in your lower back? Does it hurt to bend forwards or sideways on the side of the pain? Is your backwards bending more limited than your forward bending? You could have Lumbar Facet Irritation. In this issue of Bodi Empowerment I go over what a facet is, how it progresses and the exercises that can help. Your lower back is made up of 5 vertebrae stacked on top of each other. 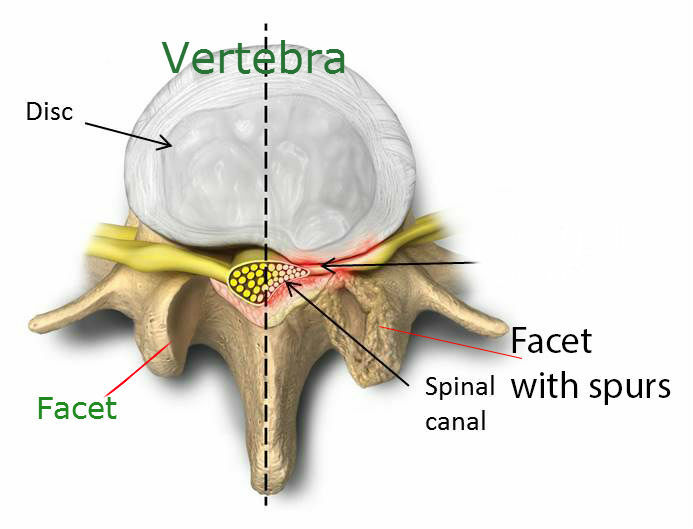 Each of these vertebrae are separated by a disc at the front and two facets at the back. Basically the disc and facets are in the shape of a tripod. Your disc acts like a shock absorber and your left and right facets help form gliding joints which help with movements like bending and twisting. Your facet joints have cartilage attached to the bone so as to allow smooth movements. The facet joints are similar to most joints in your body like the knee that also has cartilage on the bony surface. Two bones with cartilage on either side help form joints in your body. Covering the facets are a capsule which is basically a covering of the both sides of your joint. The covering or capsule of the joint is also found in joints like the knee and shoulder. The capsule helps keep a special fluid called synovial fluid within the capsule to help nourish the cartilage. Muscle guarding or tightness and tenderness when the area is pressed. 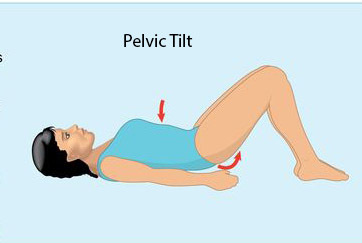 Pain in the hip, buttock and back when lifting your extended leg. Walking for long periods causes pain. Bending backwards is often more painful than bending forwards. Earlier I mentioned that the disc and facets are in the shape of a tripod. Changes at the disc like degenerative disc disease and disc herniations change the way your facets move. Your discs in turn are affected by the degeneration of the facets. Normal aging causes your disc to break down from a lack of direct blood flow which disappears by the age of 20. The discs eventually start decreasing pressure and eventually the height of your disc is decreased in height. In turn degenerative changes in the facet causes more wear and tear of the disc. Thus a cycle of degenerative changes is started in your lower back. Arthritis such as rheumatoid arthritis cause inflammation in the facet joint causing you pain and eventually damage to the joint. Surgery to fuse vertebrae often done for disc herniations will cause accelerated degeneration or osteoarthritis within 10 years that are noticeable on X-rays. Five vertebrae are normally in your lower back. When you fuse two of them you have four vertebrae. Each set of two vertebrae are responsible for some movement, so when you stop the movement of the one set, the rest of the vertebrae essentially have to do the work of the now missing movement. Typically the vertebrae above or below becomes degenerated or osteoarthritic in all areas. The disc gets quickly worn out and the facets quickly start to lose their cartilage. Many people are simply prone to osteoarthritis of the spine. Your father and mother had osteoarthritis of the spine and you have osteoarthritis of the spine. Keep in mind though that every body eventually gets osteoarthritis of the lumbar facets leading to lumbar facet syndrome. Some simply get it earlier than others. This doesn’t mean you will have pain though. You can take an X-ray of 100 people in their 50s and most people will have osteoarthritis. Only a fraction of those will actually have pain in the low back at that time. Once you have degeneration also known as osteoarthritis of the disc you can get lumbar facet syndrome. A painful irritation of the facets joints of the the lumbar spine. When the cartilage become thin or completely disappear the movement of the facets changes. To compensate and to stabilize the area the bone starts forms bone spurs. The bones grow too much and cause enlargement of the joints. X-rays allow you to see bone but not soft tissue very well. Your doctor will not be able to diagnose you with lumbar facet syndrome from X-rays. It can help to determine the level of degeneration in the facets, and see how much of the disc is left. Tell us what you think in the comments below and like us on Facebook. This downtown sports chiropractor will answer all your questions. Neck pain due to cervical facet joint involvement is known as cervical facet syndrome and low back pain due to lumbar facet joint involvement is known aslumbar facet syndrome.